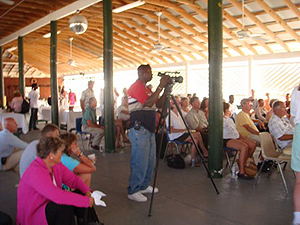 The foundation sincerely thanks all of the participants who made the effort to attend and particularly to those who were able to donate funds toward this ongoing restoration project. 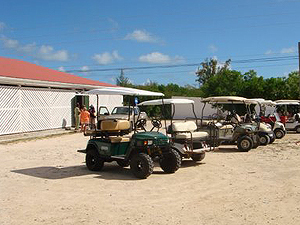 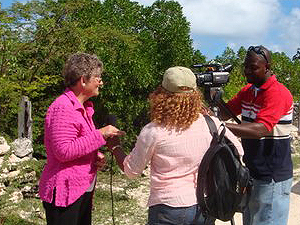 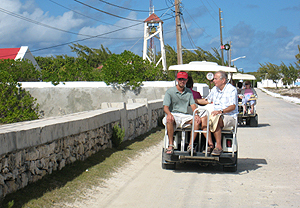 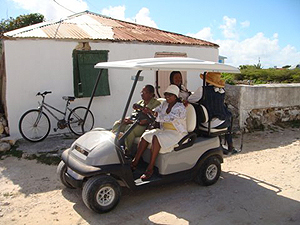 We thank the residents of Salt Cay for allowing us to visit their small island, use their golf carts, share their thoughts and enjoy the delicious food so kindly prepared to feed our appetites. 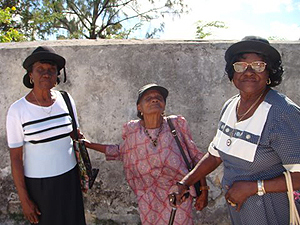 Special thanks to the ladies that cooked: Maria Jennings, Natalie Simons, Nettie Talbot, Barbara Simmons, Sheila Selver and special thanks to the staff at the Windmills Plantation. 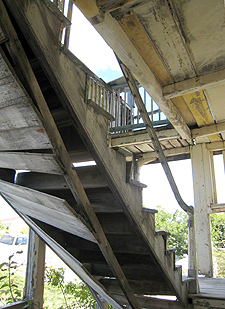 This webpage will be continually updated with the progress of the restoration. 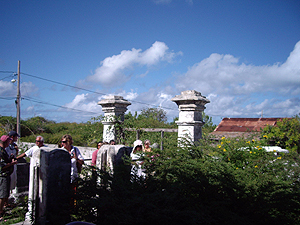 The National Trust is working with Lee Astwood architectural firm and has complete plans to restore the property. 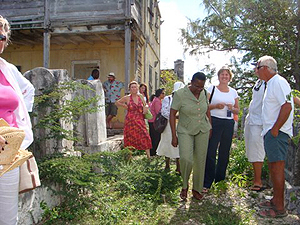 Schematics of the plan will be placed on the website when they have been updated to reflect the vision of the project which is to restore the Government House to its original fashion, including the surrounding stone walls and gardens. 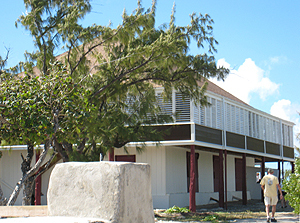 The plans are to use the Government House as a visitor’s center. 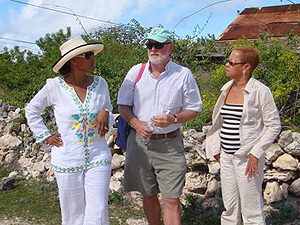 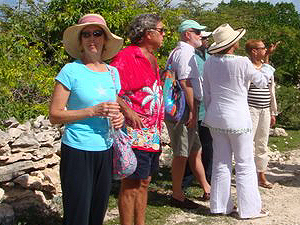 Historical Tour of Salt Cay and Fund Raising EventThe weather was sunny and breezy, a perfect day and the tour started on time at 11 am.Approximately 60 important fundraising participants attended, including Honorable Galmo & Mrs. Williams, Honorable Derek Taylor, Mr. Don Gardiner, Chairman of the Tourist Board and Dr. Neil Hitch, director of the Turks and Caicos National Museum. 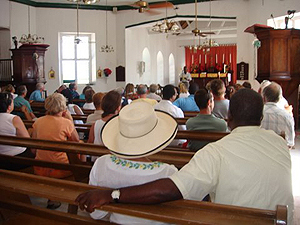 The tour started at the house Gladys Kennedy was born in and a view of the Salt Pans, then we golf-carted en mass to the Anglican Church, sat in the pews and listed to Mr. Poley Dickenson, church deacon and caretaker tell us about the church’s history: built in early 1860, destroyed by the 1925 hurricane and claims to have the highest pulpits in all the Bahamas. 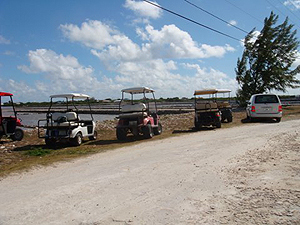 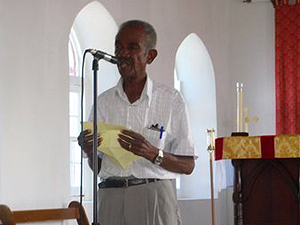 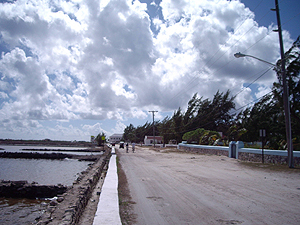 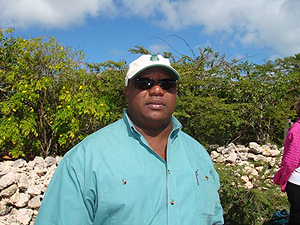 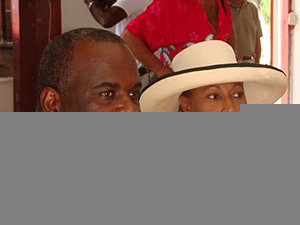 Mr. Poley, age 73, recalls his youth when salt raking was an industry on Salt Cay. 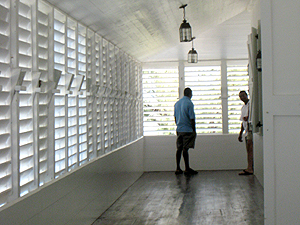 The next stop was a tour through Sunnyside, a beautifully restored residence built in the 1830’s. 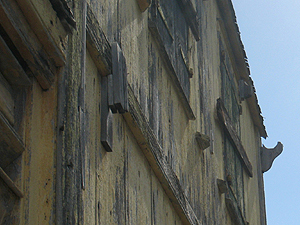 Although unfurnished, it was easy to imagine living in this inviting home as a salt merchant in the 1800’s. 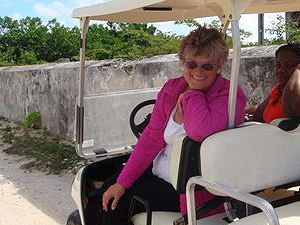 The journey back in time continued with a tour of White House conducted by Georgia Dunn, talking of her great-great-grandparents lives. 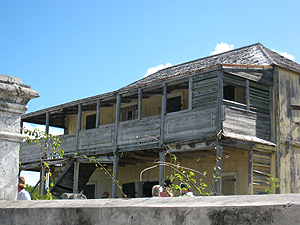 Visitors saw some of the original home furnishings of the Harriott family and plenty of evidence of what happens when buildings start to fall into disrepair. 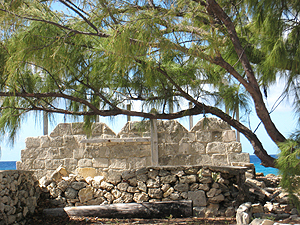 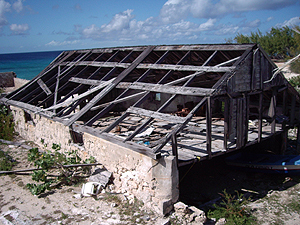 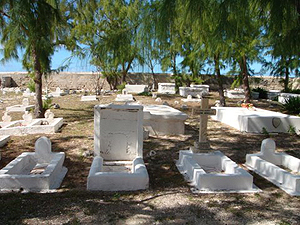 Noted was the 180 ton Bermudian limestone roof in need of repair, adjacent location of the paymasters building (which completely fell down in 2005) and the adjacent boat house which is nearly falling down. 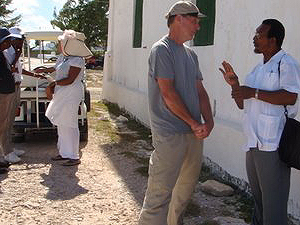 The final tour stop was at the Government House, the object of the fundraiser. 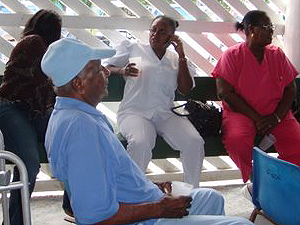 These pictures show why we need to raise funds. 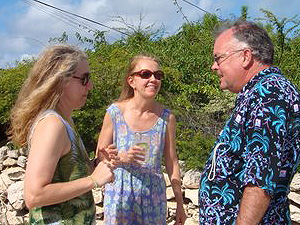 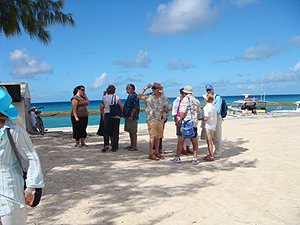 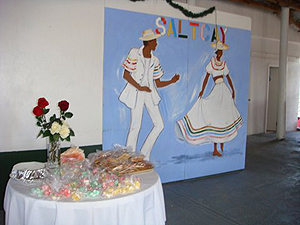 The tour ended at the Salt Shed with a presentation by Ethlyn Gibbs-Williams and Helen Krieble, a beautiful buffet lunch including conch salad, island style chicken, macaroni and cheese peas and rice, conch soup and salt cay candies followed by a stirring rendition of Salt Cay spun lyrics performed by Levi Rapoo to the tune of Jimmy Buffets’ Come Monday.